Alliance for Democracy's Portland chapter participated in a "die-in" at Rep. Earl Blumenauer's district office last weekend. 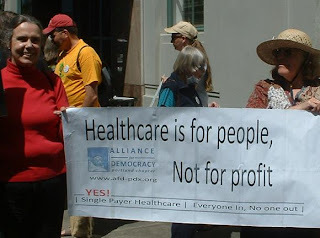 The event was organized by Single Payer Action and other groups including AfD Portland. 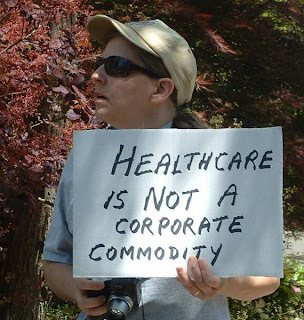 Portland chapter president David Delk wrote, "The die-in lasted 22 minutes, symbolizing the 22,000 people who die each year due to our for-profit health insurance industry. We, (between 75 and 100 people) delivered about 60 signatures called on Earl to co-sponsor Single Payer Healthcare (HB676). Some of us 'died in' in his office while others of us remained on the street in front of his office. "A couple of weeks ago Rep. Blumenauer spoke at the First Unitarian Church in a forum on health care policy. He stated then that single payer was not politically feasible and therefore he would not support it. In response to a question from the audience asking for a show of hands of who supports single payer, every hand in the audience went up. But Earl continues to believe that it is not politically feasible. Maybe not in his world but it sure is here in the streets of Portland."